To view our holistic veterinary services, go to our Services page. ...She balances her medical techniques with advanced technologies, including Bicom™ biofeedback therapy, laser therapy, pulsed electromagnetic field therapy, & stem cell therapy. She has developed a line of holistic products that have been amplified with specific healing or anti-aging frequencies. Many of these products contain Orbitally Rearranged Monatomic Elements (ORME), which assists the body to heal itself & bring it back into sync with its original DNA blueprint. These products, combined with Dr. Swanson’s intuitive ability to diagnose and treat with precision accuracy, have boasted successful results! 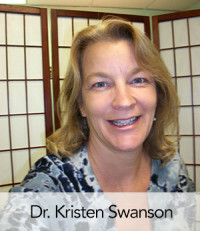 Dr. Swanson is the Medical Director of Spirit Health Synergies, a Board member of the Galactic Surf Club, a member of the International Association for Aquatic Animal Medicine, Association of Avian Medicine, American Holistic Veterinary Medical Association, American Veterinary Medical Association, & Colorado Veterinary Medical Association, to name a few. She enjoys her home life as a mother and a loving grandmother, and shares a home with her 10-year-old son, 2 cats, 1 dog, and 2 horses.